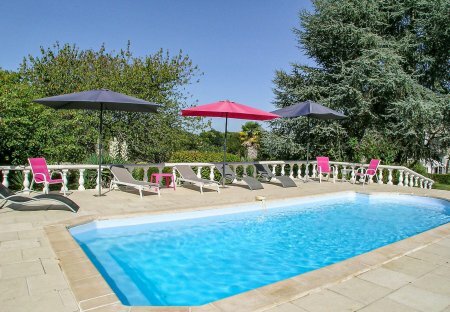 Rent villas and chateaux in Angoulême, France with private pools. Modern, well-equipped detached holiday villa with distant views overlooking picturesque countryside from the awning-shaded terrace overlooking the pool. Light. This lovely 4 bedroom 3 bathroom house with superb swimming pool, has been carefully converted to provide very comfortable accommodation for 8. Set in a very quiet position in a tiny old stone village in between Cognac, Jarnac and Angoulême. This very spacious, light holiday house has a large garden and private pool in the Charente area. The spacious house is set within 3 hectares of private garden/parkland. La Maison du Voyage is the labour of love of a dynamic and talented couple who wanted to change their lives and the lives of others.After running successful companies in the UK. This beautiful 18th Century Chateau offers the perfect blend of historic elegance and modern amenities. With accommodation for 8 adults in four large rooms, three with en-suite facilities. The charming Chateau de Seyres is ideally located in a small village in the Charente region of South West France, just on the Dordogne borders. This 2 bedroom 2 bathroom 18th century cottage was formerly the gatehouse to the manoir. Fully renovated in 2016. This pretty 2 bedroom, 2 bathroom cottage has been completely modernised into a comfortable holiday house. There is a lovely fitted kitchen and also a separate lounge. Your family may fall in love with the horses on the property of this chateau in Charente, which is replete with the warmth of the countryside.